The NYC Healthy Bites cart acts like a food truck instead of a food cart, in that it changes locations from day to day. 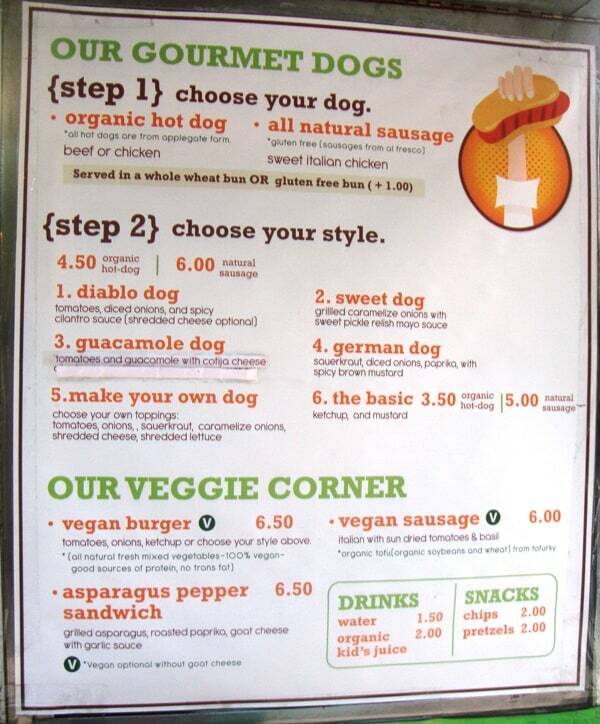 They serve organic hot dogs, all-natural sausages, vegan sausages and veggie burgers. NYC Healthy Bites recently came out with an all-natural chicken burger as a daily special, which we wanted to try for $6. There aren’t a lot of side dishes available, basically bags of chips or pretzels, so we just got the chicken burger for lunch. The first sign wasn’t a great one. After we ordered, the guy took out a container with a bunch of frozen chicken patties and put one on the grill. The chicken burger may be all-natural, but it was frozen. After it cooked for 5 minutes or so, he put it on a bun with lettuce, tomato and red onion, and asked what we wanted on it. The choices were a spicy cilantro sauce, Russian dressing, ketchup or mustard. We opted for the spicy cilantro sauce. In our experience, chicken burgers are often bland and boring, but after taking the first bite, this one had some life to it. The frozen chicken patty was re-animated. There was some spiciness, but we weren’t sure if it was the patty or the cilantro sauce. Using the most modern, cutting-edge scientific techniques available, we determined they were both spicy, but neither was brutally so. The cilantro sauce had an herby and creamy spiciness. The chicken burger grilled up nicely, and was spiced more with salt and some pepper. The red onion added some bite to the sandwich as well. Overall, we enjoyed the chicken burger more than expected after seeing them start with the frozen patty. Some guy sitting next to us in the park even asked what we were eating, because it smelled so good. We agree, it did smell good, and it tasted pretty good too. The NYC Healthy Bites cart moves around between Union Square, Flatiron, NYU, Columbia University, and a couple of other spots. Your best way to find them is on Twitter here or on our Mobile Munchies Twitter feed. You can see the full NYC Healthy Bites menu here. Next articleIs Downsizing The Next Step In Street Food’s Ongoing Evolution? Is Halal Grilled Chicken Better? We Checked!